I have just installed Acronis Drive Monitor and I am monitoring my hard drive via SMART. 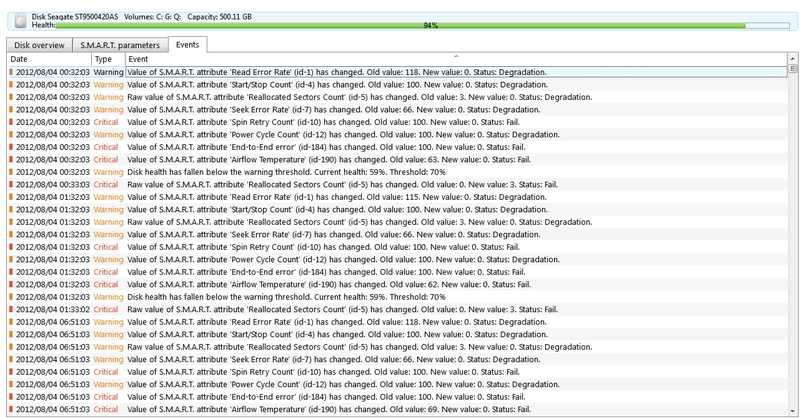 I have noticed that whenever the hard drive is very busy I get lots of alarms, and the hard drive health falls to 59%. After a few minutes it recovers to 94%. Looking at the alarms, I can see that there are false alarms. Most probably the SMART script has failed or timed out, and Drive monitor is misinterpreting the results. Are you positive there is no problem with your disk, have you tried Hard Disk Sentinel to see if ti reports similar problems? It might be worth re-installing ADM again in case something didn't install correctly the first time. C'mon Acronis its time for an updated version of the ADM.
Apart from the issue mentioned by Liviu that I have experienced a number of times I'm consistently frustrated by the random behaviour of the email client in that it works perfectly on one machine using certain parameters than refuses to work on identical machine using the same AV, firewall and outbound internet connection. Sometimes changing the email account works but in some cases I simply can’t get it to work even though ABR is able to send emails which is a real shame. I'm having the same problem as Liviu. I had a very old version of ADM installed and it happened as he describes, when there is heavy disk activity. I upgraded to the latest ADM, and now it also happens every time the computer comes out of hibernation, and frequently when the drive comes out of power-saving mode. It happens on only one of my two drives (they're different models), but I'm almost certain that there are no problems with the drive because it only started happening after I changed motherboards. The old motherboard was an Intel D975XBX with a Core2 Duo E6600, the new motherboard is an ASRock Z77 Extreme4 with a Core i5-3570k. I'm overclocking the CPU, and I haven't tested ADM without the overclocking, but the system is 100% stable at all other tasks, including stress testing, and the previous system was overclocked also. The disk that shows errors is a Samsung HD103SI. It is somewhat old, and does have a few relocated sectors, but was behaving perfectly normally before the system change. The non-affected disk is a Samsung HD204UI. I have downloaded Acronis Drive Monitor and is indicating my SSD (C:) is at 100 degrees. My Speccy shows 0 degrees. I have check drive physicaly and it is cool. Would you know what is casing the high temp. alarm? The cause is that SSD drives do not report a temperature, so ADM is defaulting to 100 deg. You can disable this report by right clicking and selecting ignore as it is of no use to you anyway.